Dangal overseas will be more than entire career of salman in overseas. LOL, RIP MATHS, RIP BRAINS, RIP LOGIC. Unfortunately, That Doesn't Sum Up To 1880Crore Either. I Would Have Wholeheartedly Accepted That Prabhas Is Bigger Than Aamir, Had You Proven Your Claim. But Just Like Your Other Claims, This One Didn't Stand Any Ground Either. 1. Baahubali 1's NETT Which Was 361Crore Earlier Is Now 419Crore. 2. Baahubali 2's NETT Recently Crossed 1000Crore And There Is No Way It Would Go Beyond 1100Crore. Salman's nationality is Indian so what matters is Salman is a bigger star than amir in India/bollywood ..
so we don't care amir is no.1 or whatever in china ..
what matters is he is still below Salman in box office star ranking ..
abhi aur kitne ATBB's & ATG's chahiye amir ko top par aane ke liye ..
@irdwhelp,Keep ur silly views to urself only. It's not @Irdwhelp's view... It's the ultimate truth.... Check any reliable trade site. So....opening, lifetime or benchmarks, salman has always been a chhota star in front of SRK. And this is just single screen era...whatever happens in coming years in the decade...less talking is better. 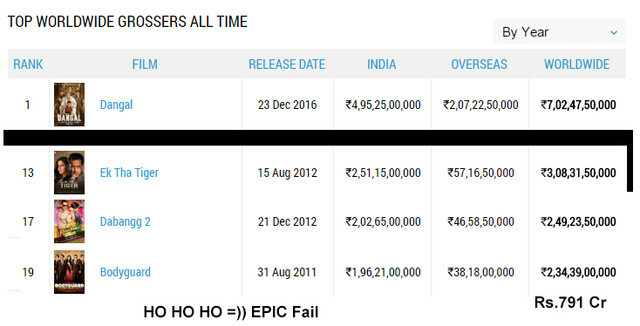 P.S : Salman's ATBBs were much bigger in terms of footfalls. As usual madhuri ki Hahk pe pal rahe ho tum aaj bhi...time for some reality check. So....opening, lifetime or benchmarks, mega ishtar salman has always been a chhota star in front of SRK. And this is just single screen era...whatever happens in coming years in the decade...less talking is better. Dangal WW collections wouldn't be crossed till many years. And They Have Stuck To MPK Footfalls. Local Star Fans, Local Talks. And so called global star yet to match that local star's debut movie's achievement...i.e BHOTD....! BHOTD, DHOTY & LANGOTY. LOL. In How many Days Happy New Year will cross the Collections of Dabangg,Ready,Bodyguard,ETT,Dabangg 2,Jai Ho and Kick ? Don't you Agree that Main Hoon Naa is better than Dabangg,Ready,Bodyguard,ETT,Dabangg 2,Jai Ho and Kick ? Which will you prefer? 1. Bodyguard,Dabangg,Ready,ETT,D2 all were blockbuster, but Jai Ho just hit! OR 2. (IF) Jai Ho an ATBB nd all other 5 films were just hits..?